Hydrastay is a new and important sporting supplement to the market. It was originally used by South African miners who endured heat-stressed and physically demanding activities. Hydrastay recognized the similarities of the sporting and mining sector and have now introduced a new and improved formula created specifically for sporting and high endurance physical activities. Hydrastay should not be confused as a product that replaces lost electrolytes or replenishes carbohydrates, as its unique formulation prevents dehydration throughout and promotes recovery after the race has taken place. Hydrastay taps into one of nature’s secrets to allow athletes to stay hydrated, to reach their optimal performance and to bounce back quicker after their strenuous physical activity. Proline – nature’s secret – is an amino acid that is found in plants, protecting them from dehydration during times of drought. Proline is found in small quantities in the human body but not enough to keep us hydrated in either extreme heat conditions or over long periods of time. This naturally occurring substance forms the key ingredient in Hydrastay, which allows the body’s cells to hold onto water more effectively and then release it slowly when the body needs it. Proline keeps muscles and joints flexible and is essential in the development and maintenance of healthy skin and connective tissues; especially at the site of traumatic tissue injury, wound healing, physical activity, high environmental temperatures, and is thus ideal for recovery after high endurance events. 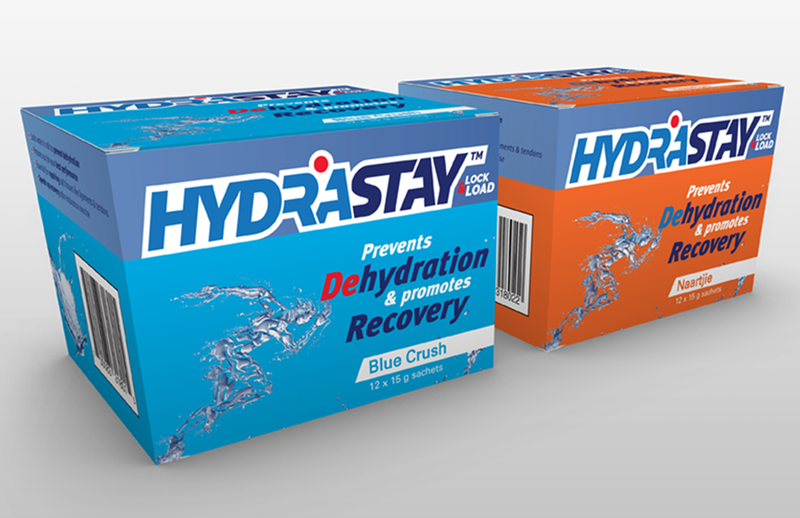 Hydrastay comes in two delicious tasting flavors – Blue Crush and Naartjie – that can easily be dissolved in 250ml or more of water. It is suggested that one sachet is taken three days consecutively before the high endurance physical event and then one more sachet after the event has been completed to boost the recovery process.